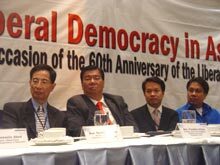 The Liberal Party of the Philippines started off its 60th anniversary celebrations with a regional conference and a book launch on 19 January, 2006 in Makati City. The National Institute for Policy Studies (NIPS) and the Friedrich Naumann Foundation (FNF) jointly sponsored the seminar “Advancing Liberal Democracy in Asia.” It brought together international and local liberal leaders to talk about the birth, the gains and the consolidation of democracy in the region. Hong Kong Member of Parliament Martin C.M. Lee pointed out that in order for democracy to exist there cannot be room for corruption and cronyism. Thailand Member of Parliament Dr. Buranaj Smuthraks elaborated by adding in order for liberal democracy to prevail, political parties need to bridge the widening gap between representative and participatory democracy. “We must realize that, more than ever before, it is the people themselves that play the most important role in the direction of liberal democracy,” he said. Rep. Dina Abad and Rep. Neric Acosta present the book to the public. 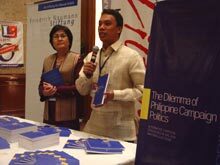 Following the conference, Liberal Philippines and FNF hosted the book launching of The Dilemma of Philippine Campaign Politics. This book focuses on the 2004 campaign strategies of Bukidnon Representative Neric Acosta and Batanes Representative Dina Abad. Both are members of the Liberal Party of the Philippines. “Democracy is about elections, and elections are won or lost in electoral campaigns,” said FNF Resident Representative Dr. Ronald Meinardus. “In this book, we have a description of two campaigns that set new standards. My hope is that the book will not only be read by researchers and academicians, but also by new and old candidates for political office,” he concluded. The Dilemma of Philippine Campaign Politics is available in all major bookstores.